Well, we sure weren't lazy today! We actually set an alarm this morning--we were up and around early. 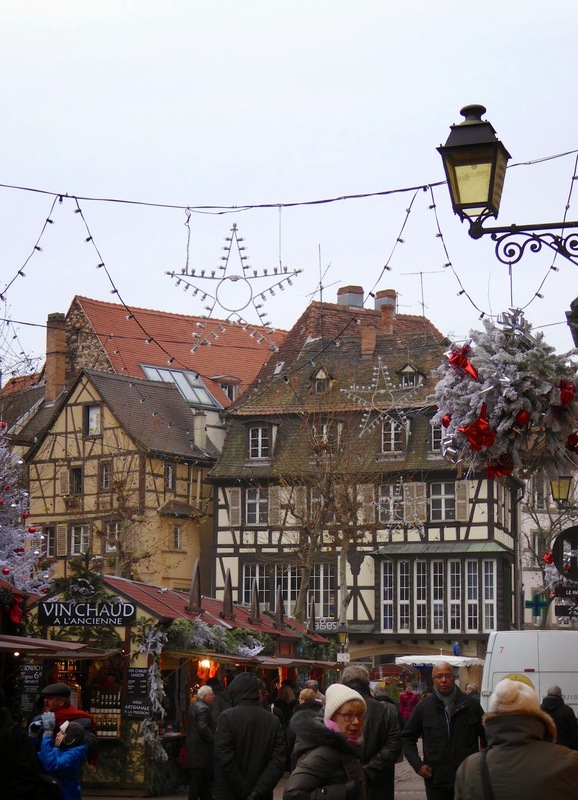 We had plans to take the train to Colmar, a small town south of Strasbourg. We wanted to get an earlier start than we did yesterday! After our coffee and breakfast, we bundled up in all of our layers and walked to the tram station. It's just a few blocks from our apartment. 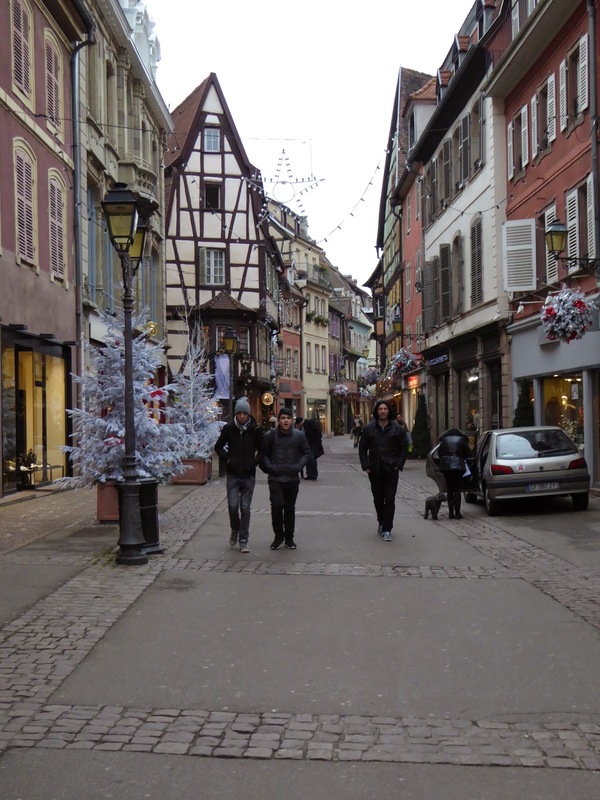 We rode the tram to the train station, where we bought round trip tickets to Colmar. 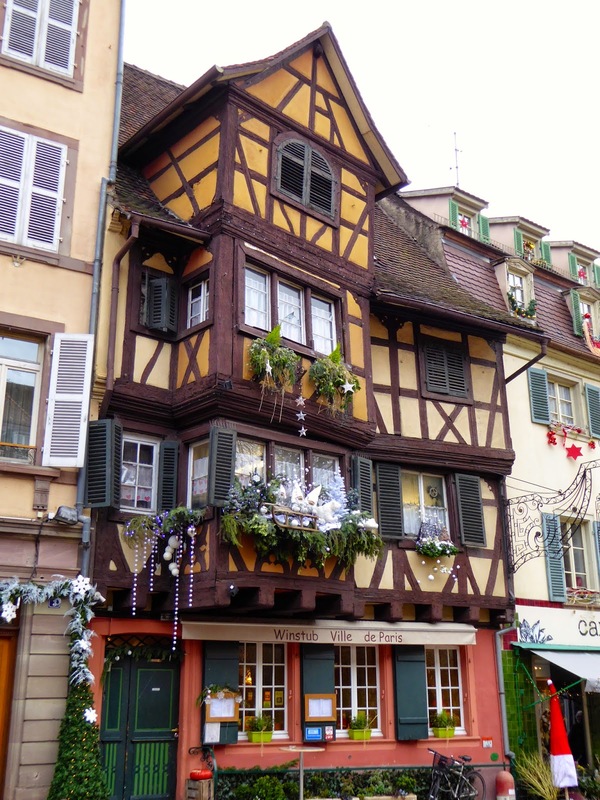 It's only about a 25 minute ride from Strasbourg. 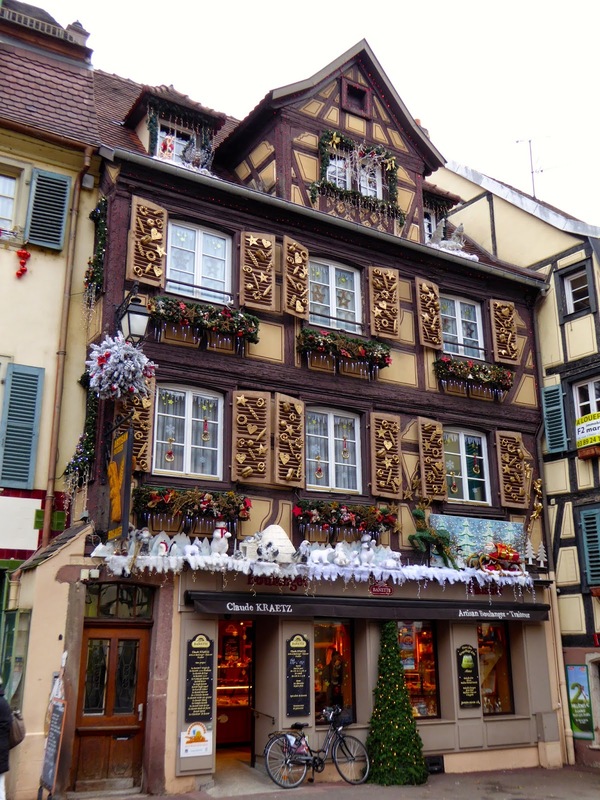 Colmar was founded in the 9th century, and since 1871 has changed hands between Germany and France 3 times. 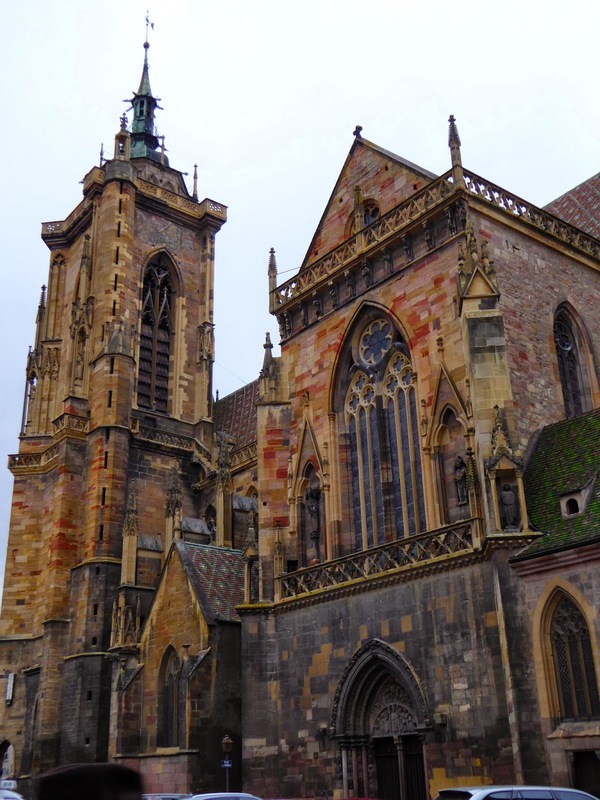 Colmar even belonged to Sweden for a short two years in the 1600's. The German influence is obvious in the architecture and the cuisine. 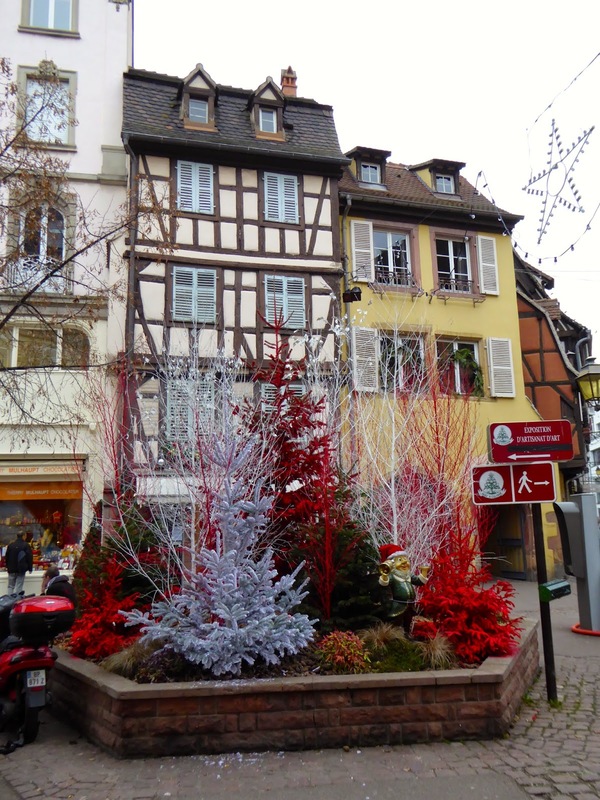 We pulled into Colmar about 9:50, found our way out of the station and followed the helpful signs to the Marche Noel in the center of town. It's a several block walk into the center of town. and by the time we got to the first market, we decided we needed a warm up before exploring the market. We thought it was a bit early for hot wine, so we sat in a small cafe and enjoyed a cup of coffee while we warmed up. 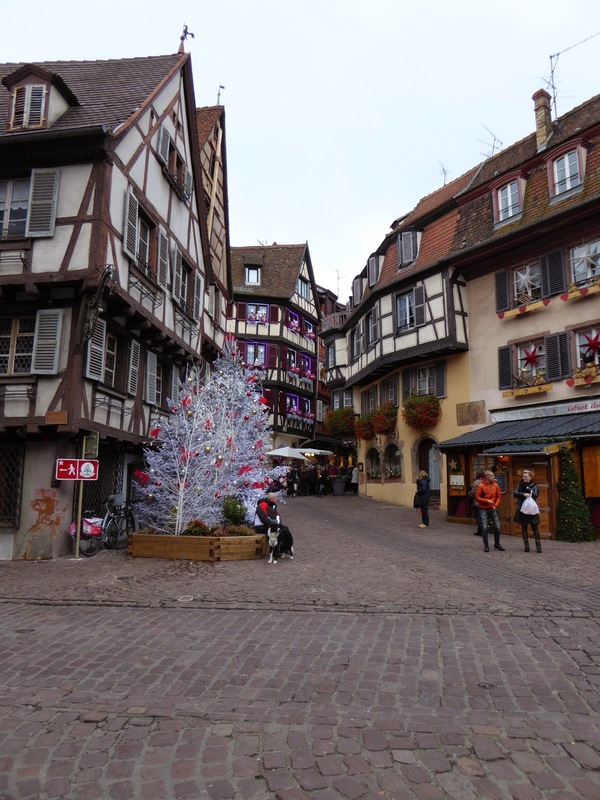 Colmar is a beautiful little town with narrow winding streets lined with pretty half timbered buildings. Very picturesque! About noon David informed me that it was way past time for a hot wine, and I agreed--we were VERY COLD! It was in the mid 30's and windy today, and I think we've lost our Pioneer Alaska badges--we've turned into wimps! 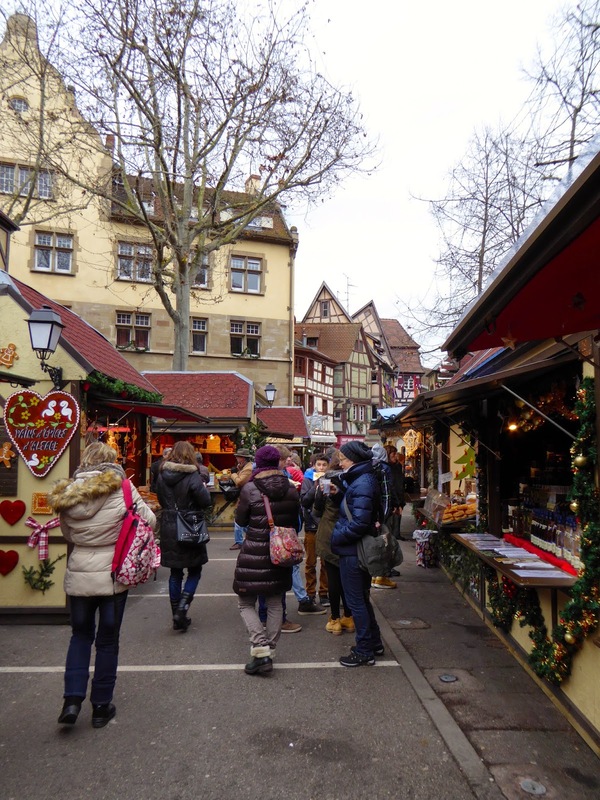 We really enjoyed the markets in Colmar, most of the items for sale were locally made--we saw very little "made in China" stuff. We did buy a few treats--some locally produced sausages, a delicious confiture de Ongion (onion jam), a pretty hand carved wooden spatula, and a bar of scented soap. I also found a couple of cute items for (soon to be) sweet baby Scudder! By 1 pm we were very cold again, and ready for some hot lunch. We found an old "bierestub" (kind of like a pub) and enjoyed a bowl of onion soup and shared a big bowl of sauerkraut and various sausages and ham. Just like yesterday, we had a loooong lunch so we could warm up! This is one of a couple of huge old churches we saw--this one was especially pretty. We did a quick look around the inside--very gothic in style. They also had a small petting zoo. Matt, this is for you--we just couldn't resist!! 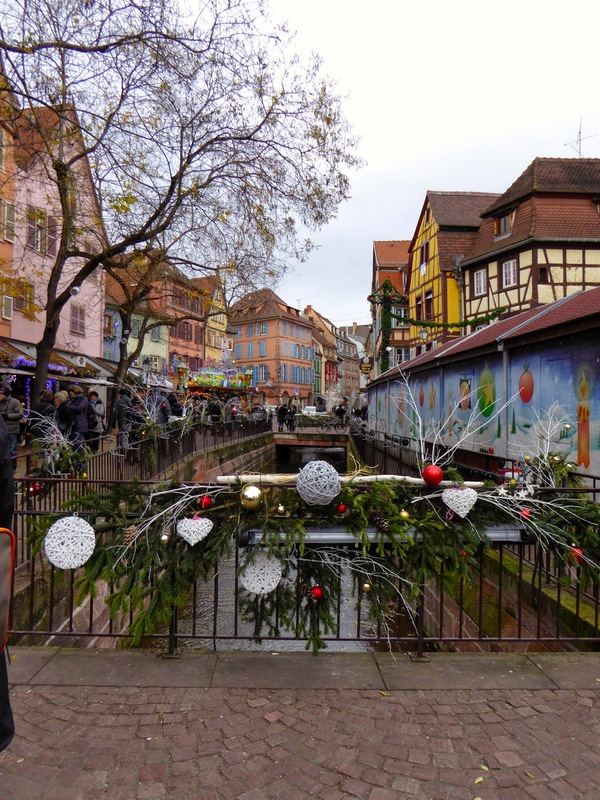 After visiting all the markets and wandering around beautiful Colmar, we decided it was time to head back to the station. I can't say we enjoyed the long, cold walk back---brrrrr! 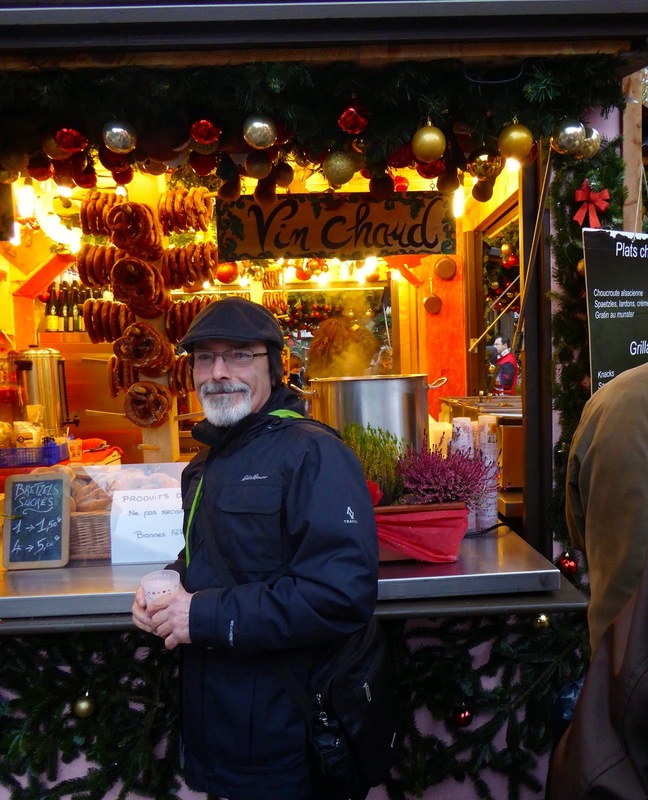 At the Strasbourg station we caught the next tram to our neighborhood, and made a quick stop into the market for a bottle of wine. We needed a mug of hot wine to warm up, we are both chilled to the bone! In a flash of brilliance (ha!) I actually brought mulling spices from home! We also picked up a couple of other necessities, such as TP. Dinner tonight was leftover soup from last night and some of the delicious sausage we bought in Colmar. We added a fresh baguette and some of the confiture d ongion--mmmm good! Yes--this is Holiday TP! What will they think of next?? Looks like another wonderful day and quaint, beautiful new town. 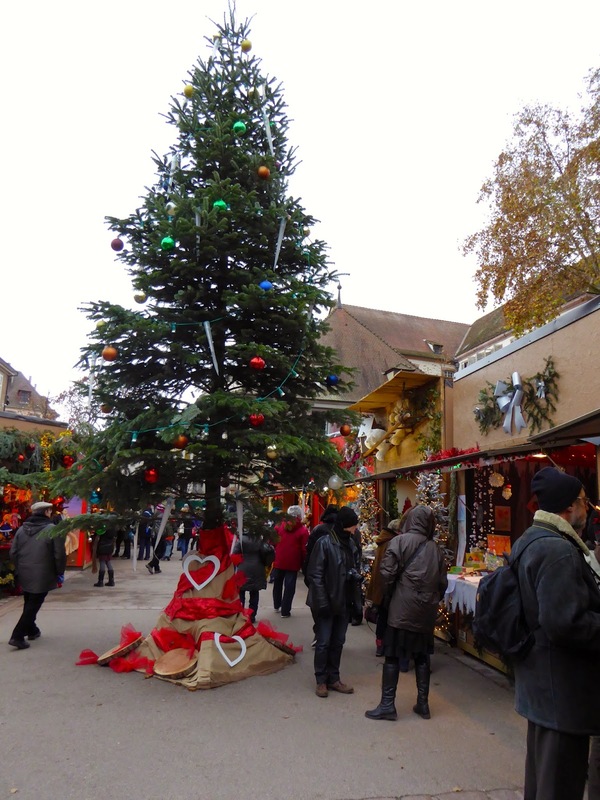 Love all of the Christmas markets. Yumm, hot spiced wine sounds rreally good---especially when you ar cold and need to warm up.